North Dakota is located in the Midwestern region of the United States, along the Canadian border. Like South Dakota, high temperatures reach 90 degrees farenheit during the summer, while harsh winter temperatures often fall below 0 degrees. North Dakota is home to many holy sites that are important to Native American history and spirituality. Major points of interest include American Indian sites and battlefields (Big Mound for example), the International Peace Garden (on the border of Canada), Theodore Roosevelt National Park and the State Capital building in Bismarck, to name a few. To travel around the state, you can book a train ticket, but renting a car is more convenient for getting around and exploring the state. For more information visit: www.ndtourism.com. Buffalo Monument in Jamestown. Photo by Tourjamestown. 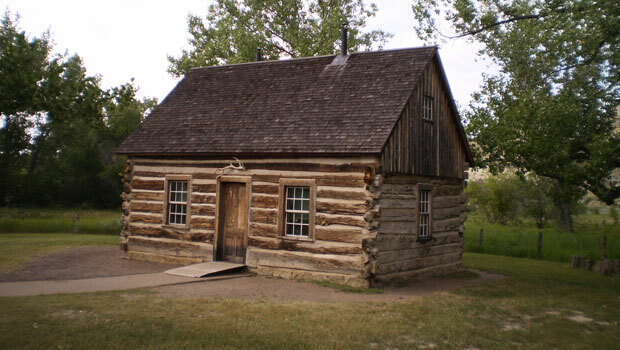 Bonanzaville in West Fargo recreates part of North Dakota’s history with a pioneer village, a museum, and original buildings like a general store, prairie church and schoolhouse. A popular event at Bonanzaville is Pioneer Days – visit the Local Festivals page to learn more. Fort Union Trading Post is home to a partially reconstructed trading post on the North Dakota/Montana border that was originally built in 1828. Visitors are able to see what life was like in the 19th century for fur traders and the native Plains Indians that traded at the site. A hiking trail, visitor center, museum and reconstructed Trade House are also available for visitors. See a replica of an ancient Viking ship and a Norwegian Stave church at the Hjemkomst Center in Moorhead, Minnesota, located a few hundred feet across the border from Fargo, North Dakota. Special cultural and historical events are also held at the center, home of the Historical and Cultural Society of Clay County. Knife River Indian Villages National Historic Site was one the location of a major trade center for the Hidatsa tribe and other Northern Plains Indians. The site contains a recreated Earthlodge, Hidatsa garden, nature trails, decorative artwork, and actual artifacts and from the original village site. The Prairie Village Museum in Rugby includes 23 historic buildings and six exhibition halls to teach visitors about the pioneer days of the 19th century in North Dakota and the local area. The Red River Zoo in Fargo is home to many native and exotic animals, including the grey wolf, prairie dogs, otters and red panda. Educational programs and events also take place throughout the year at the zoo – check the website for details. 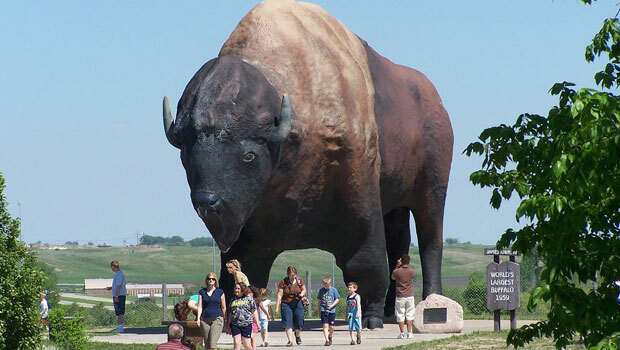 See the world’s largest buffalo statue in Jamestown, also known as the “Buffalo City.” Visitors can also stop by the National Buffalo Museum in Jamestown to learn about the history of the bison, the culture of the Great Plains, Plains Indians, artwork and other information about the buffalo. There are no professional sports teams in North Dakota, but visitors can watch popular American sports by going to a college game or watching a minor league sports team. Browse a full list of college sports teams in North Dakota. Theodore Roosevelt National Park. Photo by Podruznik. Lake Sakakawea is located on the Missouri River in northern North Dakota and is one of the largest man-made lakes in the United States. At Lake Sakakawea State Park, visitors can go fishing, canoeing, kayaking, hiking, biking, cross-country skiing and snowshoeing. Cabins are also available to rent. Visit a ranch in North Dakota to try out activities like horseback riding, calf roping, wildlife viewing and other outdoor activities. Visitors can often go to working ranches or former ranches that are now historical sites. Learn more at the North Dakota tourism website. Lewis & Clark State Park offers many opportunities for outdoor recreation, including hiking, canoeing, kayaking and swimming, and snowmobiling, snowshoeing and cross-country skiing in winter. Theodore Roosevelt National Park remembers former President Theodore Roosevelt and a trip the president took to North Dakota that prompted his interest in conservation. Visitors can go camping, biking, fishing, canoeing, kayaking, horseback riding, take a guided tour or try cross-country skiing or snowboarding in the winter. The park is located in the badlands of western North Dakota. Downhill skiing and snowboarding is available at four ski areas in North Dakota – Huff Hills, Bottineau Winter Park, Bears Den Mountain Ski Area and Frostfire Ski Resort. Beginners can take lessons and try out easier trails, while more experienced skiers and riders can try out intermediate and advanced trails. North Dakota’s population is made up of many people with German, Norway or Native American ancestry, and these cultures have also had an impact on the cuisine. International visitors in North Dakota may find dishes like lutefisk, lefse, kuchen, spaetzle, summer sausage and buffalo. Local produce and game is also popular, including rhubarb, juneberries, chokecherries, elk, duck, walleye (fish), trout and salmon. North Dakota farmers’ markets offer fresh fruit and vegetables, homemade goods and often other products from local growers and artisans. Downtown Street Fair in Fargo. Photo via Flickr. Both the Scandinavian Hjemkomst Festival and Viking Midwest Festival takes place in June at the Hjemkomst Center in Moorhead, located about 500 feet across the border of North Dakota. The festivals celebrate Scandinavian culture and Viking heritage in the Midwest with traditional arts and crafts, dancing, music, entertainment and food. 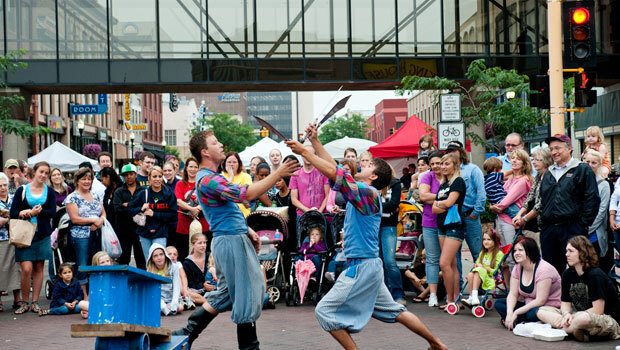 The Fargo Downtown Street Fair is a free outdoor festival in July featuring food, arts and crafts, a marketplace and live entertainment. Northern Plains Indian Culture Fest in July is held at Knife River Indian Villages National Historic Site. The event celebrates the Northern Plains tribes with traditional cultural activities and demonstrations from skilled artisans. The historic site is located about one half mile from Stanton. The North Dakota State Fair in July features carnival rides, food, music concerts, live entertainment, contests, livestock competitions and much more. The event is held in Minot at the Fairgrounds and it is the largest even in North Dakota! Pioneer Days at Bonanzaville recreates pioneer history with cultural demonstrations, live entertainment, educational events and food. The event takes place in August at Bonanzaville in West Fargo. Norsk Hostfest in Minot is the largest Scandinavian festival in North America. The October event includes contemporary and traditional music, food, arts and crafts, clothing, jewelry, dancing, concerts and live entertainment, including characters from Scandinavian folklore! Find more information on upcoming events and local festivals on the North Dakota tourism website’s event page. Two companies operate bus services in North Dakota and to surrounding areas: Greyhound and Jefferson Lines. Amtrak’s Empire Builder travels between Chicago and Washington State, making stops in Fargo, Grand Forks, Devil’s Lake, Rugby, Minot, Stanley and Williston. Volunteer Match, Idealist and Serve.gov are three general volunteer websites that match local organizations with volunteers in their communities. RSVP + North Dakota helps volunteers find community service opportunities throughout North Dakota. There are both ongoing and one-time volunteering opportunities for volunteers with different types of skills and levels of experience. Habitat for Humanity in Grand Forks and Minot allow individuals and groups to help the organization build houses for families in need. Volunteers do not need any experience to help with home builds! Volunteer at the Fargo Marathon and help organize a great community event. Volunteers are an important part of the event and the marathon couldn’t go on without their help. Great Plains Food Bank needs volunteers to help with tasks like sorting through donations, packing meals, sorting clothing, helping with events and assisting in the office. Groups and individuals are welcome.